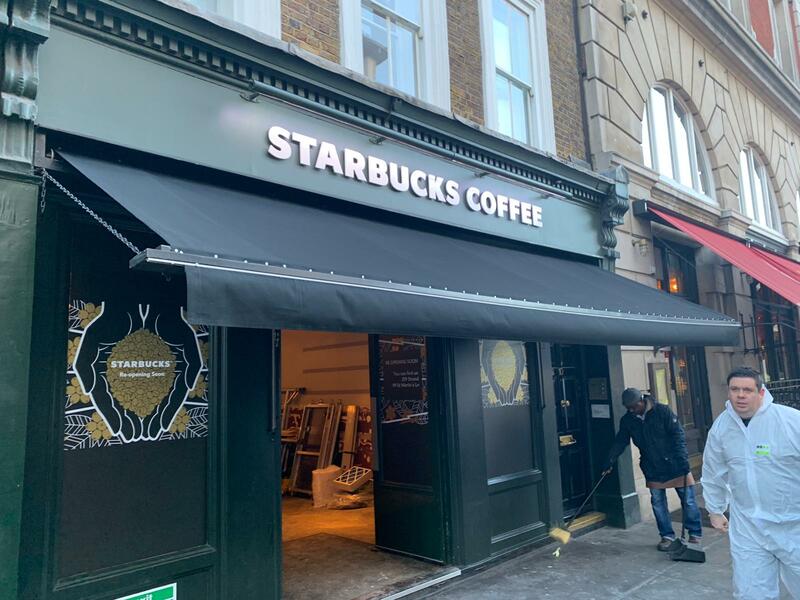 We fitted a new cover, valance & wooden front rail for this branch of Starbucks in Central London. It closed recently for a refurbishment. As a result, Radiant Blinds & Awnings removed the old cover and valance and replaced with new. Additionally, we had to replace the wooden front rail as this had become rotten in places. Not all awning companies use undercoat on their wooden front rails. Consequently, this can lead to the wood becoming rotten over a couple of years. Therefore, at Radiant Blinds & Awnings, we always use the correct undercoat and then 2 coats of top coat paint. .If components are damaged or broken, Radiant Blinds & Awnings can mend and replace parts in most cases. Our team has many years of experience. Therefore, we know how to mend If components are damaged or broken, Radiant Blinds & Awnings can mend and replace parts in most cases. Our team has many years of experience. Therefore, we know how to mend Traditional Victorian Awnings, sometimes referred to a Shop Blinds. Our factory in London stocks many parts as we manufacture the awnings in house. 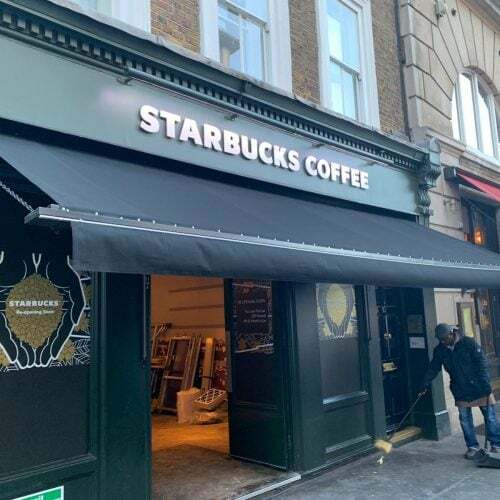 Get in touch today if you have an awning that needs recovering or repairing. In May 1998, Starbucks successfully entered the European market through its acquisition of 65 Seattle Coffee Company stores in the UK. The two companies shared a common culture. For example, they focused on a great commitment to customised coffee, similar company values and a mutual respect for people and the environment.